Elephants and naked mole rats are two animals that rarely get cancer. Scientists believe these two creatures may have genetic mechanisms that allow them repair damaged DNA (which could otherwise precipitate tumors). Unfortunately, household pets (especially cats and dogs) are not so lucky. Why are so many pets getting cancer? Indeed, these beloved creatures are experiencing higher rates of cancer than even humans. For instance, today one person out of five will get some form of cancer in their lifetime. But one out of every two dogs will develop the disease at some point. All told, at least six million dogs and six million cats will be diagnosed with cancer this year. 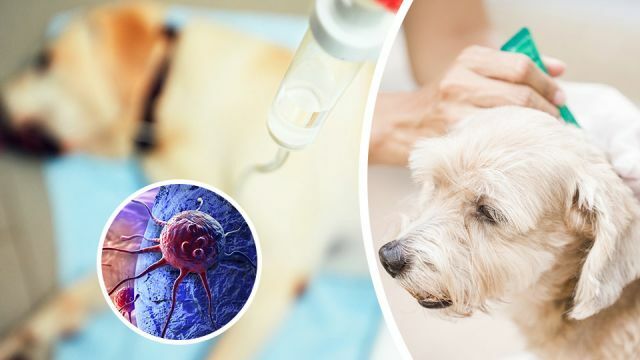 Veterinarians often explain these alarming stats by telling owners that it’s because their pets are living longer than ever before and tumors are almost inevitable in old age. However, it’s not just advanced age that seems to be a problem. In all probability, inflammatory diets, toxic pet care products, and environmental factors are contributing to the epidemic of cancer that is afflicting cats and dogs. With that in mind, here are seven likely carcinogenic culprits that you’ll want to keep your pet away from as much as possible. Animal lovers have been horrified to learn about some of the stuff that turns up in many brand name pet foods. Part of the problem is that the FDA hasn’t made the health and well-being of cats and dogs much of a priority. Another problem with conventional pet food is that it is heat-processed and loaded with preservatives. All this is meant to extend the shelf life of the product, but these methods can subtract years from your pet’s life. That’s because heavily processed foods tend to stimulate compounds called cytokines, which promote inflammation in both the gut and throughout the body. Chronic inflammation is a known risk factor for cancer and other diseases. For instance, it can precipitate a condition known as leaky gut syndrome, which can upset your pet’s hormonal balance while triggering an overactive immune system. Increasingly, scientists believe that intestinal integrity is one of the keys to avoiding and preventing cancer. Many veterinarians do recommend conventional pet food brands, but the evidence suggests that both humans and pets are better off eating more nutritionally-rich raw foods. Of course, cats and dogs have unique dietary requirements, which generally includes consuming excellent protein sources such as meat (along with raw veggies, grains and fruits). For some further helpful info on what your pet should be eating and why — plus some recipe ideas — please click here. Cats exposed to secondhand smoke are 2.5 times more likely to get lymphoma than felines from smoke-free homes. Similarly, dogs exposed to secondhand smoke are at much greater risk for respiratory and nasal cancers. Smoking isn’t good for you, but it’s especially bad for your pet. Now, you have another good reason to quit the habit! Artificial preservatives like BHA, BHT and ethoxyquin have been linked to a variety of health problems and are suspected carcinogens to boot. Pet food companies could opt for all-natural preservatives such as tocopherols (vitamin E), citric acid (vitamin C) and rosemary extract, but they don’t because that would cost more. To avoid artificial preservatives you can look for organic brand pet foods that specify that they have no artificial additives or preservatives. Many popular flea and tick control remedies include suspected carcinogens like fipronil and permethrin. These chemicals have been shown to cause tumors in laboratory studies and have been linked to thyroid problems as well as cancers of the lung, liver and thyroid too. At the very least, you should limit using conventional flea and tick products to the months when these pests are active. For an even better solution, it’s very easy to make your own apple cider vinegar flea and tick repellent spray. To learn how, please click here. Earlier studies have found a link between lawn sprays and bladder cancer in pets. Eradicating dandelions and other weeds may provide aesthetic benefits, but there’s a tradeoff that may impact your pet’s health. At the very least, try to keep your pets away from lawns that have been treated with toxic herbicides and pesticides. Formaldehyde has long been suspected to be a carcinogen and a health hazard to both humans and pets. Unfortunately, this chemical is used to treat and persevere everything from cleaning agents to cosmetics to furnishing (like sofas and carpets). To reduce exposure, scrutinize product labels and avoid shampoos, laundry detergents and other household products that specifically include formaldehyde or any of the following ingredients: Quaternium-15, Diazolidinyl urea, Imidazolidinyl urea, DMDM hydantoin and Sodium hydroxymethylglycinate. It’s hard to avoid carpeting and other furnishings treated with formaldehyde, but thankfully the chemical begins to break down when exposed to fresh air. Therefore, keeping your home well-ventilated can help reduce the health hazards from formaldehyde exposure. By the way, dogs and cats have very different types of skin than people. So, never use a shampoo intended for humans on your dog or cat. To avoid a shampoo with harmful preservatives (like formaldehyde), try making your own with these simple DIY recipes for dogs and cats. There is not a real lot of evidence tying radiation from cell phones, TV screens and computer to cancer in pets, but it’s well known that other forms of radiation (including ultraviolet light and x-rays) can damage DNA. Cats and dogs love warm places, but allowing them to fall asleep directly under the TV, on top of a computer or near WiFi routers is probably not a great idea. It’s hard to avoid electromagnetic pollution these days, but keeping your pets at least several feet away from common devices can help reduce their exposure. Hey Buddy!, I found this information for you: "These 7 Products Are Causing Cancer In Your Pets". Here is the website link: https://www.thealternativedaily.com/these-7-products-are-causing-cancer-in-pets/. Thank you.